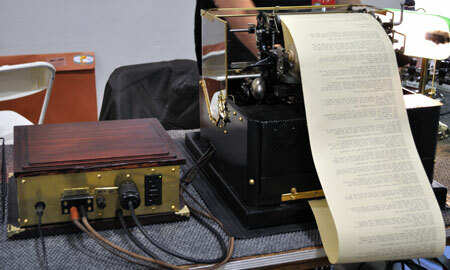 Amid the fire-breathing snail carriages, steam-powered snow-cone machines, and Tesla-coil light shows at last month’s Maker Faire in San Mateo, California, one trend caught our eye: people appeared to be taking a lot of liberties with typewriters. At one end of the spectrum was the Aetheric Message Machine Company, Ltd., whose refurbished Model 15 Teletype machine from the 1940s formed the heart of a defiantly archaic text-messaging service. People attending the Faire could send text messages from their cell phones to the machine, which would clatter away as electronic bits were transformed into ink on paper. Messages were then painstakingly cut from the spool of paper on the machine, carefully placed into yellow envelopes with cellophane windows, and then hand stamped with the time and a serial number. Then and only then were the messages hand delivered by members of the St. Clair Aeronauts. Why would anyone go to all this trouble to convey a message by hand that could more easily be sent electronically? Because they can. 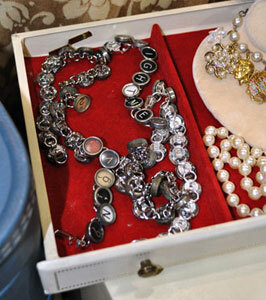 Over at Effie’s Heart, amid the racks and piles of retro-glam fashions, we noticed several necklaces made out of typewriter keys. This is the sort of thing that drives typewriter collectors crazy—to cannibalize a perfectly good (or, at least attractive) machine for the sake of personal vanity! “That’s like killing an elephant for its ivory,” you could almost hear them say. We blame Pearl Jam for this destructive trend. After all, their latest vinyl record and CD, “Backspacer,” features a cover by artist Tom Tomorrow that spells out the band’s name in vintage typewriter keys, separated from their levers in the name of rock ‘n’ roll. Still, a necklace made of numbers, letters, and punctuation marks is gentle stuff compared to the typewriter carnage perpetrated by Jeremy Mayer, whose anatomically correct human torso called “Delilah,” made entirely out of typewriter parts, was both beautiful and unnerving. According to his website, Mayer has been dissecting Underwoods and other vintage typewriters since he was a lad. 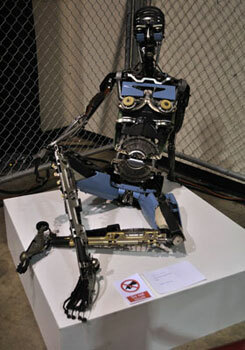 What makes his sculptures especially interesting is to learn that they are not glued, soldered, or welded. Instead, Mayer relies on what’s he calls cold assembly, which must be cold comfort to typewriter collectors. Still, not all Makers at the Faire had it in for typewriters. Over at The Poetry Store, you could pick up lovingly restored Royals and other models for not much more than lunch and a couple of beers for two at the Faire’s Midway area. And if you just wanted the social benefits of owning a typewriter without actually buying one, you could hire one of the store’s resident poet’s to write an original poem for you, typed on a manual typewriter, and mailed to anyone you like for as little as six bucks. “ ” I remember purchasing a ceramic Mammy salt-and-pepper shaker, and I broke it in front of the seller. I would like to think it was an act of philosophical integrity, but I probably just hated the thing.